...in which the author recounts traveling about in a Retro travel trailer named Blue Suede and a pickup named Black Beauty. 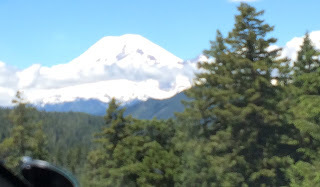 The weather in Oregon has been less than conducive to RVing for the past several months. We have got out a couple of times to visit Champoeg State Heritage Area. It is one of our favorites because there are miles of trails for walking and biking. When I found that we had a couple of days of reasonably dry weather in the forecast, I decided it was time for a getaway. So, yesterday we hooked Blue Suede up to Black Beauty, rolled her out of the garage and hit the road. 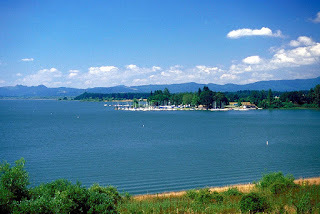 We went all of about 60 miles to Richardson County Park on Fern Ridge Reservoir near Eugene. Our favorite space at the park is #12, which is closest to the water's edge and the marina. There was a little hiccup in the process. Having been away on a men's retreat over the weekend and seeing that the weather was encouraging, I got on the park website to make a reservation, but I was a little bleary-eyed and thought that Sunday was May 1st. Consequently, I booked us in for May 2nd- May 4th. We showed up at the park on May 1st, and after I sheepishly explained my error, the camp host was kind enough to change the dates of our stay. So, here we are parked among the trees about 50 yards from the marina. The park is well maintained and very pretty. It is situated on the Northeast corner of Fern Ridge Reservoir. This morning we took a walk from our campground to the dam on the north side of the reservoir. I would guess it is about a mile or a bit less each direction. Lulu was happy as a lark running in the grass and then splashing in the edge of the lake. She was worn out when we got back and hasn't been a bit demanding since. place to sail, with steady winds, which were not blowing today. and there is a yacht club to the left. There was one spillway open in the dam today. You can see the tail race in the photo. I don't know whether this dam provides any hydro power. One of many oak trees around the lake. This one is covered with Spanish moss. Jill said it reminded her of her recent visit to New Orleans. The Fern Ridge Dam was completed in 1942, and is currently one of 13 multi-purpose dams operated by the Corps of Engineers in the Willamette Valley. The dam provides flood control, irrigation, recreation, navigation, and improved downstream water quality. 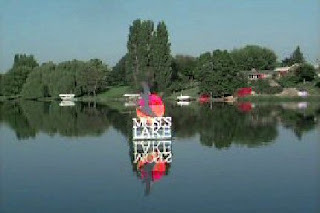 The water level is kept high from May through September for recreation purposes. Throughout the summer, the water level is lowered by up to 3 feet (0.91 m) to provide for downstream irrigation needs, and is further lowered after September to provide necessary water storage capability to prevent possible downstream flood damage during the Willamette Valley's rainy season. The U.S. Army Corps of Engineers’ major repair effort of Fern Ridge Dam on the Long Tom River near Eugene began in June 2005 and was completed in late October 2005. The internal drainage system was repaired and the embankment dam was rebuilt. And here is a photo taken in nicer weather (also from Wikipedia). I can't say we will have any further adventures here, but stay tuned, and find out!! Sometimes, life is just too good! Wonder of wonders, we are out in the woods and still have enough connectivity to blog! After our last trip, we had to take Blue Suede to the dealer for repair of a split board that supports the fresh water tank. I would have done it myself, but since the trailer is under warranty, I was afraid my doing so would lead to voiding the warranty. That knocked 3 weeks out of our camping season. So, it has been seven (count em' 7) weeks since we last camped. In the interim, I spent a month nursing a sore back (this year's episode), but now I am back in the pink. Yesterday, we left home after church and drove about 60 miles to River Bend County Park, in Linn County, near Sweet Home. We need to look up these berries and identify them. There are lots of them here. I suspect they are not edible, or someone else would have picked them by now. The weather for the next day or two is expected to be unseasonably warm; 88 degrees today, for example! We intend to do more hiking, more reading, more relaxing and eat the cinnamon rolls that Jill is currently baking in the modified pressure cooker. I have been remiss in posting. We made a trip to South Beach State Park, near Newport, OR in the beginning of August. Actually, we left on July 31st, so we were camping on July 1st and 31st. I like that. We stayed at South beach for three nights and had some interesting experiences. The local mountain huckleberry bushes were heavy with fruit. Right in our own campsite, we were able to get enough berries for a huckleberry crisp and some delicious huckleberry bread. That might not be so noteworthy, were it not for the fact that we have no oven in Blue Suede! But the old blogger dug deep into the recesses of his memory (which is usually not too reliable) and dredged up the recollection of baking brownies aboard a boat that had only a two burner cook top. A couple of years ago, I picked up a pressure cooker at a garage sale or thrift shop or somewhere and tucked it away in the kitchen. Jill was not too keen on the idea of a pressure cooker and worried that we'd blow ourselves to kingdom come. Nevertheless, when we packed for the cross country trip, I threw in the pressure cooker "just in case" we wanted to try baking. While Jill was off flying to the SF bay area for her niece's graduation, I was left behind to get into trouble, at which I am quite adept. During those few days, I baked some passable biscuits*. Were they a bit dark on the bottom? I admit it, but nevertheless, they were recognizable as biscuits and actually even edible. When Jill returned from her gallivanting, I baked her some biscuits, which she liked, and then she baked some cookies, which we both liked. The big problem was that the bottoms browned too much, but we were both hopeful that we could actually bake on board Blue Suede. Fast forward to South Beach. When we harvested the huckleberries, we were prepared. Prior to the trip, we purchased a small, round cake pan at the Dollar Tree. By turning it upside down on top of the insert in the bottom of the pressure cooker, we were able to lift the baking items enough to alleviate the excessive browning on the bottom. And voila, a delicious huckleberry crisp and perfectly browned batter bread chock full of huckleberries! To say we were pleased and not a little proud would be to understate the facts! Now for the bad news. On our cross country trip, I generally made sure we had the fresh water tank about 1/3 to 1/2 full, in case we needed to use the bathroom along the way. Just before we headed for South Beach, I was inspecting the under side of the trailer and discovered that the support for the water tank was broken. By all appearances, the support consisted of a piece of (probably) particle board wrapped in a plastic material for weatherproofing and supported by two metal straps. The board was split lengthwise across the whole length of the tank, and the straps were bowed. My first impulse was to pull it all down and repair it myself. Then I remembered that the trailer is under warranty, and I was concerned about voiding the warranty. I called the dealer, thinking, "This is such an easy repair it shouldn't take them long." And indeed the service manager looked at the problem and said it would take about a week. Well, that was three and a half weeks ago, but we finally got the call yesterday that Blue Suede is ready to go. So, today we will bring her home and begin planning our next outing. * DISCLAIMER. When baking in a pressure cooker, it is important to remove the rubber gasket that makes a seal between the pot and the lid and to forgo the use of the pressure regulator weight. In other words, the pressure cooker becomes nothing more than a large covered pot, and no pressure is allowed to build up inside. In fact, any large, heavy, covered pot (e.g., a Dutch oven) could be used instead. 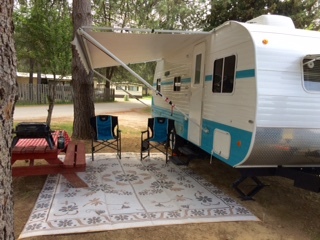 It occurred to me that, when we arrived yesterday at the Riverfront RV Park in Woodland, WA, it was the first time we had checked into a familiar RV park since we left home on April 15th. Every prior park on this trip was new to us. That is significant, since this is the 31st place we have camped. Well, it is like home, because we have been here so many times in the past, and because it is so comfortable. The staff are friendly and helpful. The grounds are immaculate. The river is right in front of our window. The dogs love to walk along the river's edge. (So do we!) The amenities are great: cable TV works; wi-fi is great; water, sewer and electricity are all handy at our site. So, we are relaxing for the last four days of our trip and working our way up to being in our real home. Here's the view from our dinette window. In three more days we will head for home. It will be very strange to be in one place day after day, although we look forward to seeing our friends and our family. I think we could both continue traveling for some time to come, we are so comfortable in our Blue Suede home. Nevertheless, there are good things about being home, too. One of them will be planning our next Black and Blue adventure. Mount Rainier (pronounced: /reɪˈnɪər/), Mount Tacoma, or Mount Tahoma is the highest mountain of the Cascade Range of the Pacific Northwest, and the highest mountain in the state of Washington. It is a large active stratovolcano located 54 miles (87 km) south-southeast of Seattle. It is the most topographically prominent mountain in the contiguous United States and the Cascade Volcanic Arc, with a summit elevation of 14,411 ft (4,392 m). Mt. Rainier is considered one of the most dangerous volcanoes in the world, and it is on the Decade Volcano list. Because of its large amount of glacial ice, Mt. Rainier could potentially produce massive lahars that could threaten the entire Puyallup River valley. 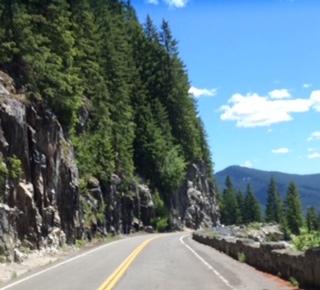 Today's adventure was to drive the loop from Packwood to the Paradise Lodge in Mt. Rainier National Park and back. What a ride. Some of the roads and some of the views rivaled Glacier National Park...some of them. Still, this was a trip well worth making, especially since my Senior Pass, purchased 8 years ago for $10, saved us $25 in entry fees. Skate Creek Road leaves Packwood near the east edge of town. It winds its way along the creek for several miles and climbs rapidly. Finally, Skate Creek Road intersects with SR706, which leads into the National Park. Once inside the park, the road twists and turns like an angle worm on a hook. It also continues to rise, eventually coming to timberline and the Paradise Lodge. This being a warm Sunday in June, the road and especially the parking lot at Paradise was full of cars. 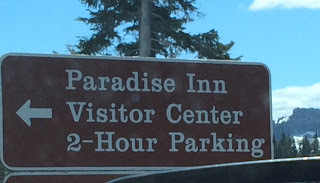 In fact, the ranger at the park entrance was just putting out the sign about the full parking lot, when we arrived at the gate. 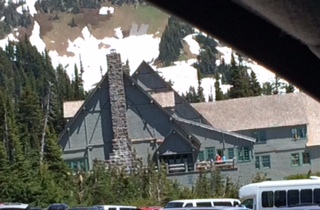 The Paradise Lodge looks quite lovely, and sits at timberline, with the snowy peak of the mountain in the background. Since there was no parking available, we were unable to explore the lodge, but that was okay, because the mountain and the adjacent peaks and the rivers and lakes are so much more beautiful. 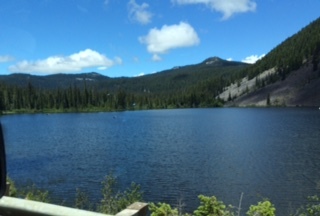 This is one of the mirror lakes. The mountain top from the box canyon wayside. We were in need of a comfort station, and as we emerged from a tunnel, I spotted one at the Box Canyon wayside. This area is wonderful. 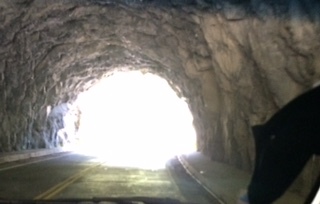 The tunnel is very rustic looking, as if it was blasted from solid rock. And the bridge over Box Canyon is all made of stone. It looks like a WPA project. But what really makes the area is the box canyon. Unfortunately, this is one of those places that cannot be captured on film, although I was willing to try. What looks like a narrow channel is actually parallel vertical walls about 100 feet high. This sign is posted on the railing of the bridge. The loop took about four hours to drive. It could have taken a lot longer, had there been less traffic and more available places to park and investigate. Still, we had a great time, worked in a picnic lunch and had the dogs out of their crates by 2 PM for a walk and "business" duties. I'll bet you thought I was on vacation! Oh, wait. I am on vacation. Anyway, I have been unable to blog for several days, because I have not had adequate access to the internet. So, I am hoping that my current setup will allow me to publish something fun. US2 winds through the mountains in northwestern Montana. 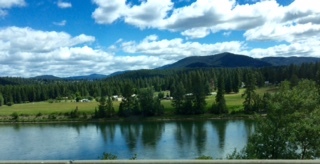 The Kootenay River runs along the highway. These shots were taken near Libby, MT. 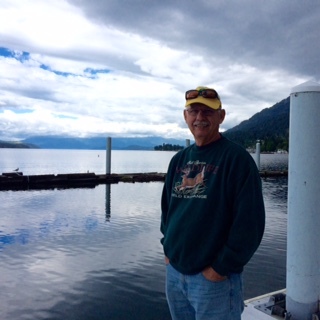 At last we arrived at Sandpoint, ID, a small town on the north end of Lake Pend Oreille. This is a huge lake carved out of the area by glacial action in the ice age. It is 1,180 feet deep! We continued on US95 to Sagle, ID, which is a small town about six miles south of Sandpoint, where we stayed at the Travel America RV Campground. The park is fairly nice, but the wi-fi was nothing but frustrating. Here's our little abode in the Travel America RV Park in Sagle. On Monday, we went into Sandpoint and checked out the shops downtown and the public beach, which is at a city park in the heart of town. It has sandy beaches and a protected harbor, where the locals moor boats by the dozens. Very nice. How we missed taking pictures there is anyone's guess. Tuesday was our day to explore the east side of the lake. We drove to Hope, ID, population 89 and then on to East Hope, population 220. From there we took some side roads and found a resort called Beyond Hope! Lots of RV parks, State Parks and little harbors are to be found along this route. We stopped at the Floating Restaurant in East Hope and had lunch. The view of the lake was as good as the veggie and sausage soup we had. One of the local residents near Beyond Hope. The old blogger on the dock in front of the Floating Restaurant in East Hope. We left Sagle, ID on Wednesday and traveled to Leavenworth, WA. The trip didn't offer too much variety of landscape until the very end. 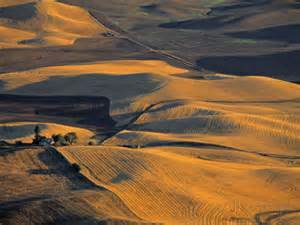 Most of eastern Washington State along I90 is either flatland with agribusiness or sagebrush, or it is rolling grassland, called the Palouse after the Palouse River which flows through the area. In turn, the river is named after an Indian people of the region. The monotony of the landscape was broken up about halfway along our route by Moses Lake. I had heard of the city of Moses Lake for a long time, but this was my first time driving through. I said to Jill, "I don't know if there is a body of water called Moses Lake or just a town." Then we passed through the middle of a large body of water that seems to divide the town on a north-south axis that gave me the impression that the lake is roughly shaped like a figure of eight, with the town tucked into the space around the "waist" of the eight. Eventually we came to the Wenatchee Valley. I had been there as a kid but had no recollection of it. It is a beautiful area covered with orchards and vineyards, nestled among the mountains, with the Wenatchee River running through the valley. Everywhere we looked there were fruit stands. 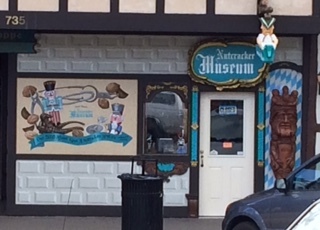 A few miles further along the road, we came to Leavenworth. This little town is nestled among some very steep-sided, craggy mountains that remind me of the Alps, which I had the good fortune to see about 30 years ago. The townspeople, some time ago, decided to redo the town as a Bavarian Village. The transformation is nearly universal among the buildings in the business section. It really does resemble a town in Bavaria. On the other hand, not all of the business owners, at least one restaurant owner, have been to Bavaria, judging by the soggy mess that we were offered, purporting to be Wiener schnitzel. So, bottom line, it is a cute little touristy town, but we agreed one visit is sufficient. I took this one for our daughter, Tara, who is nuts about nutcrackers. 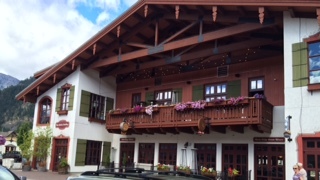 One of the many Bavarian style buildings. The old blogger in the restaurant (which shall remain nameless) with the soggy Wiener schnitzel. That being said, we did find a metal sculpture gallery that had some interesting pieces at very reasonable prices. We purchased a nice sculpture of a great blue heron for the chimney in our home. Yesterday, we explored the Icicle River canyon, which runs up from the Icicle River RV Park, where we were camped for the last three days. The canyon is pretty steep, so the river runs very swiftly. There are numerous campgrounds in the area, many of them maintained by the forest service. There are also several very inviting private homes along the river. The view from our table at Heidi's Kaffee Haus. Note the interesting architecture in the background. And check out the beautiful architecture on this one. The building in the background is nice, too. While we were at Icicle River, our next door neighbors were a couple named Norm and Joy. They are a bit older than we are, but they are full of vim and vigor. We enjoyed chatting with them, and they gave us some great tips about what to see and do in the area. They come to the area about twice a year, and they had been there about a week when we arrived. We bid them a fond farewell this morning and headed south on US97. Our route today took us through Yakima, where my grandma lived all the time I knew her. I had looked up her address on Google maps, and her house is still there. It was actually a duplex, in which she rented an apartment. Oh how the memories of Grandma and my Auntie Faith and Uncle Walter came flooding back. Jill enjoyed learning a little more about my past life. If I recall correctly, I hadn't been to Yakima since 1978. It was a good stop. 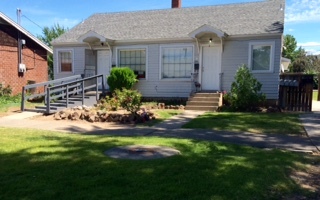 Grandma lived in the right hand apartment, 203 1/2 S. 9th Avenue. The yard has changed, but the house has not. Heading west out of Yakima, we followed US12 as it winds through the Cascade Mountains. 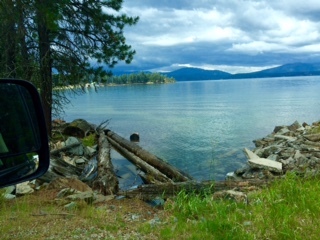 Halfway up the grade, we encountered Rimrock Lake, which is a rather large mountain lake with trees down to the shoreline and a number of campgrounds and hostelries along the highway. I told Jill to write it down on our "gotta look this one up" list. We may want to camp there some time. It would be a great place to take our kayaks. US12 runs alongside the Tieton River. Jill loves the milky green color. Here's a shot of Rimrock Lake. Note the same milky green color. We kept on climbing past Rimrock Lake and passed Dog Lake, a smallish lake with a campground. 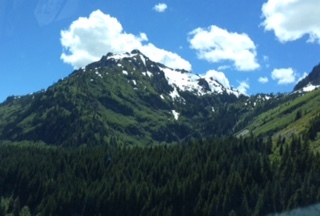 Then we arrived at White Pass. This area is host to a great ski resort on the southern slopes of Mt. Rainier. I have skied there, but I have never seen it bare before. It seems smaller somehow, without snow all over everything. Here is little Dog Lake. Coming down the west slope of the Cascades the scenery continued to enthrall us. Finally we came to Packwood, WA, where we are camped for the next two days at the Packwood RV Park. We took a little stroll around the town, explored the local hardware store and stopped at the tourist info center and got a map of Washington State. Some other Cascade peaks on the way to Packwood. is abandoned now, but it must have been nice in its day. Here is the current Packwood Hotel, next door to the log motel. Meet Virgil Jeffries, mayor of Packwood. Tomorrow we hope to explore Mt. Rainier National Park. I am a follower of Jesus Christ, a husband, a father of three, grandfather of five, a U.S. patriot, and recovering dentist.